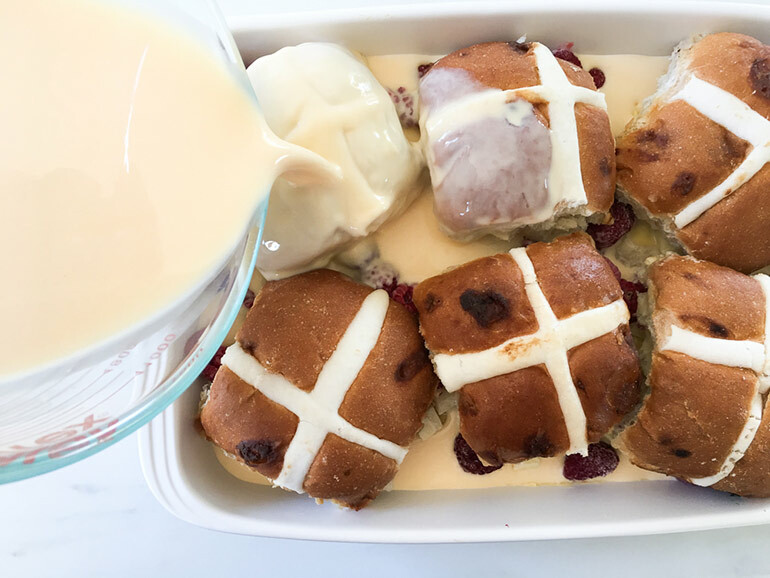 These Limited Edition White Choc and Raspberry Hot Cross Buns would make a pretty stellar Limited Edition pudding, right? 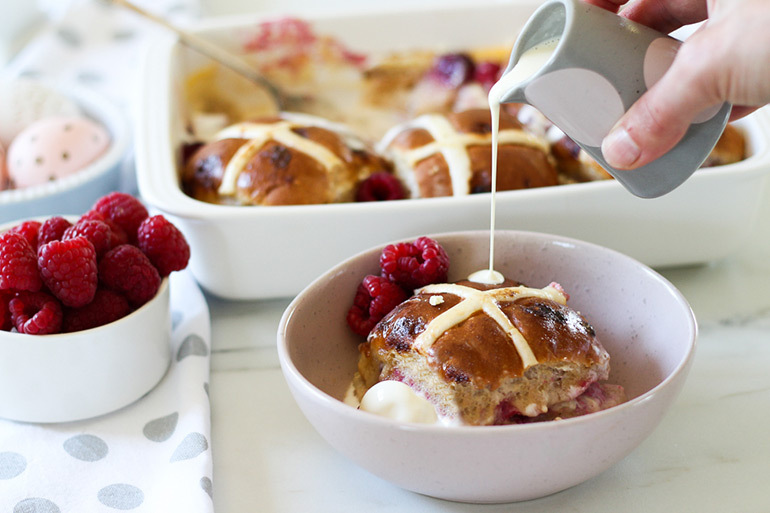 So we did and it turned into one super easy, super delicious pudding you’re going to want to deliver (and completely devour) this Easter. 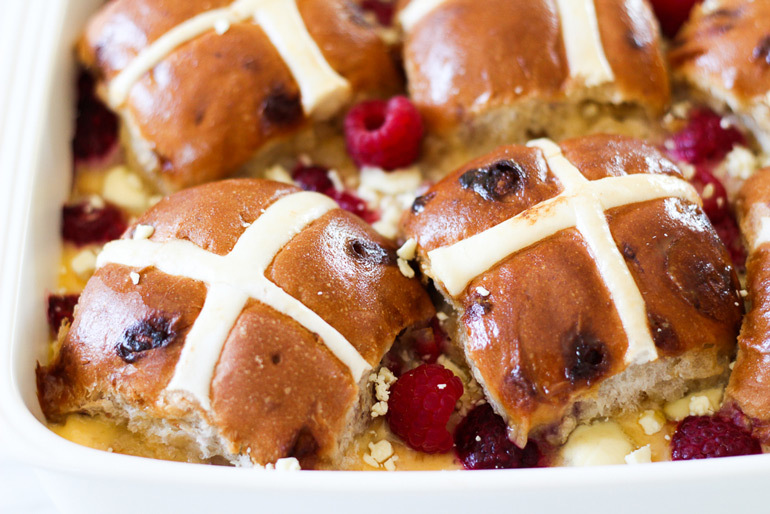 It’s the perfect recipe for hot cross buns. 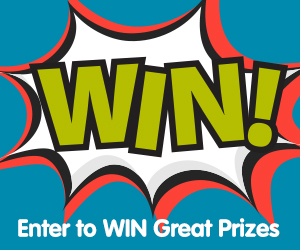 Whether they’re leftovers, fresh out the packet, stale or heck, even half eaten by a toddler. 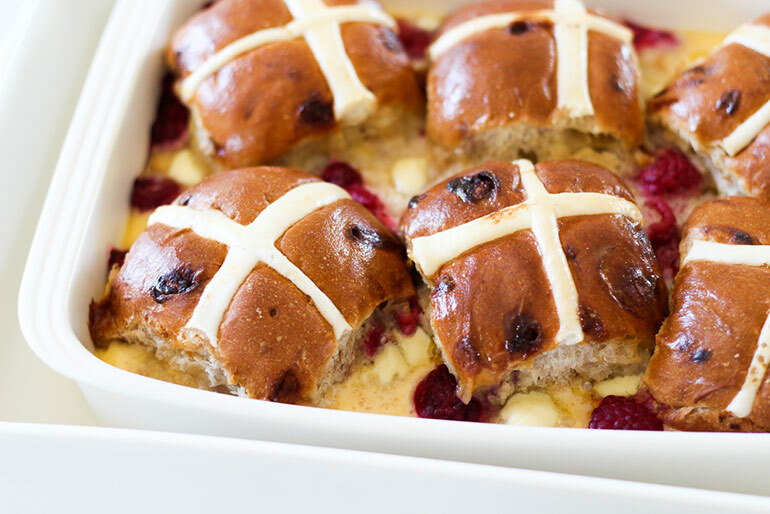 ALL hot cross buns can be used for this belly-warming pudding. But first, some hot cross bun chat. What flavour of bun are you? 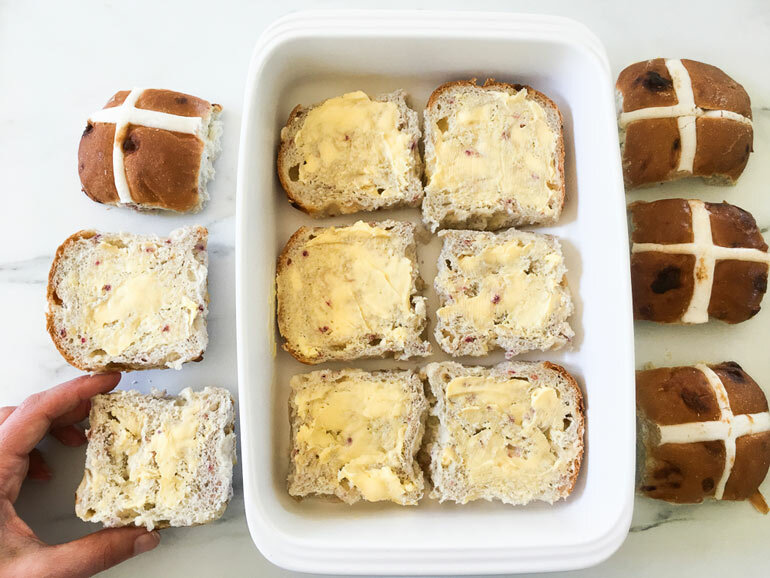 Given they’re one of my favourite things about Easter, I’ve been doing quite well to resist the lure of the hot cross bun. That is, up until I clapped eyes upon a pack of Woolworths White Choc & Raspberry Hot Cross Buns ($3.50 per pack of four). Hold up Easter Bunny, what is this delicious sorcery? 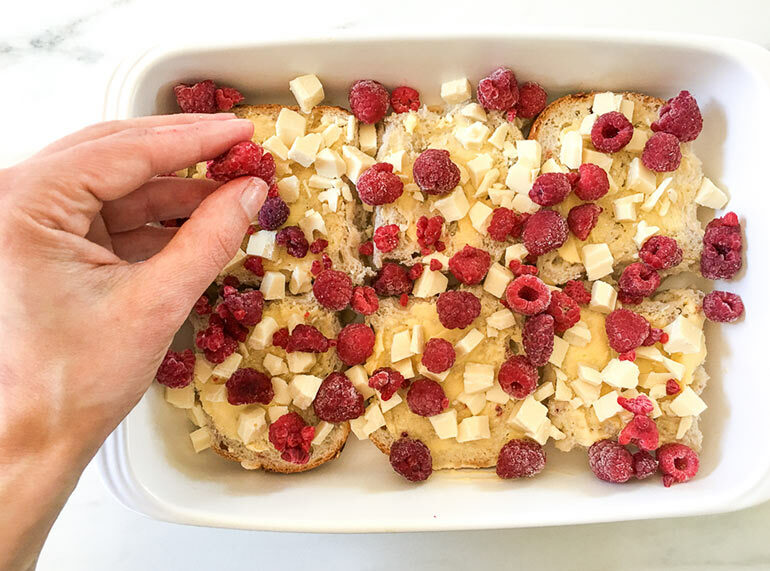 Perfectly spiced hot cross buns with white chocolate pieces and real raspberries studded throughout. Pure magic. Naturally I absolutely must try these limited edition buns. Raspberry not your thing? 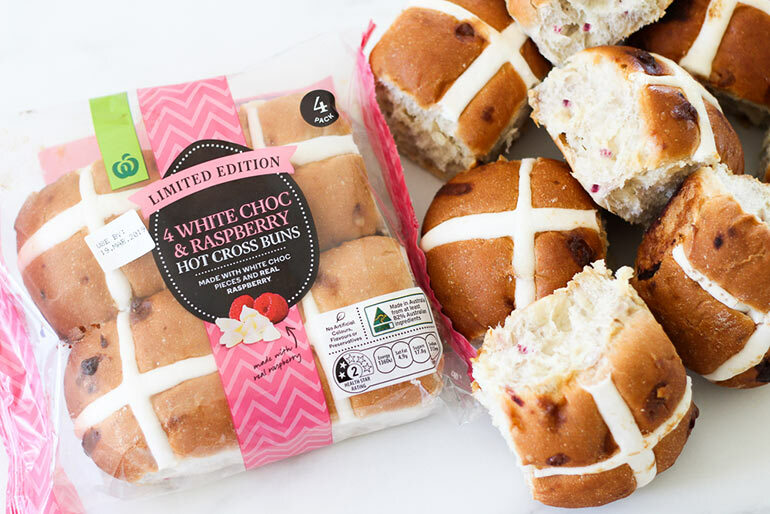 You’re SPOILED FOR CHOICE when it comes to hot cross buns at Woolworths this Easter. Banana and Caramel, brioche, traditional fruit, fruitless, chocolate – you name it, you’ll find them all at Woolies. I race around filling my basket with all that I need to create a dessert which tastes amazing, brings all the ooohs and aaahs to the table and won’t kick my grocery budget to the kerb. On that note, who knew that Woolworths Frozen Raspberries are just $4 for a 500g bag? FOUR DOLLARS. So here’s my haul at the ready, now get set for the most epic of hot cross bun puddings. Try it for yourself with the recipe below! This recipe uses a water bath method of cooking to prevent the custard from becoming rubbery in texture. Make sure your pudding dish will fit inside some kind of roasting dish, either metal or ceramic. If you don’t have a big enough roasting dish, use a disposable roasting tray, supported by a baking tray to take the weight. 1. Lightly grease a 2-litre ovenproof dish and set aside. 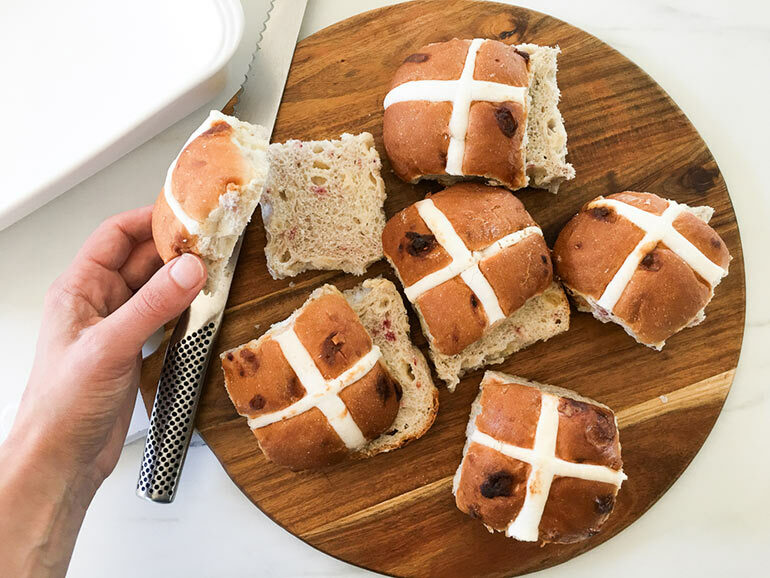 Slice the Woolworths White Choc & Raspberry Hot Cross Buns in half evenly so that you have tops and bases. 2. Butter each half and place the bases into the pudding dish. 3. 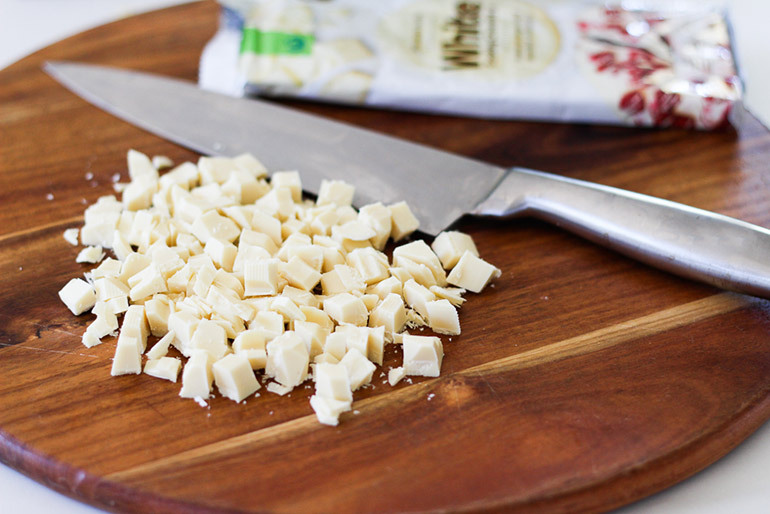 Chop the white chocolate, scattering the pieces over the hot cross bun bases. 4. Scatter the frozen raspberries over the top of the chocolate. 5. 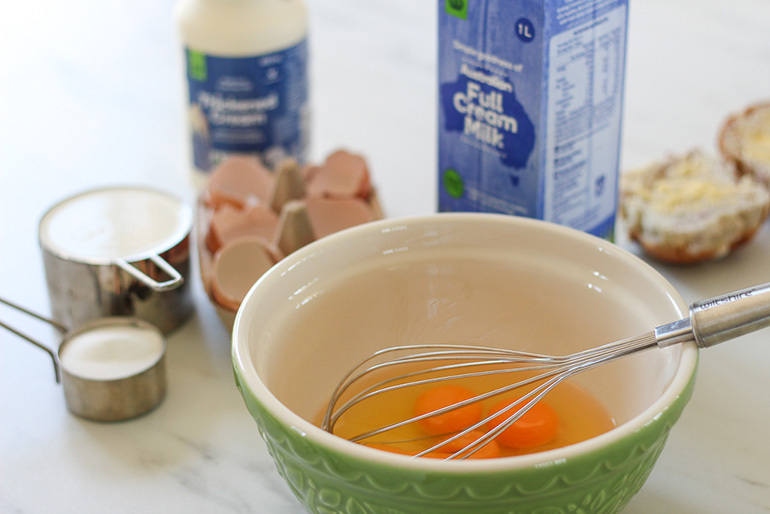 In a large bowl, whisk together the eggs, milk, cream and sugar. For a silky smooth custard, pour the mixture through a fine sieve into a jug (or another bowl). 6. 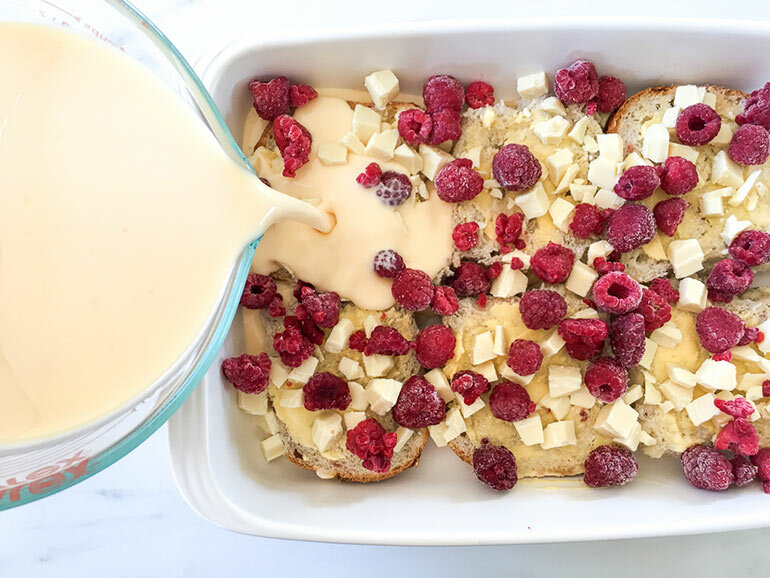 Pour half of the custard mixture over the raspberries, white chocolate and hot cross bun bases. 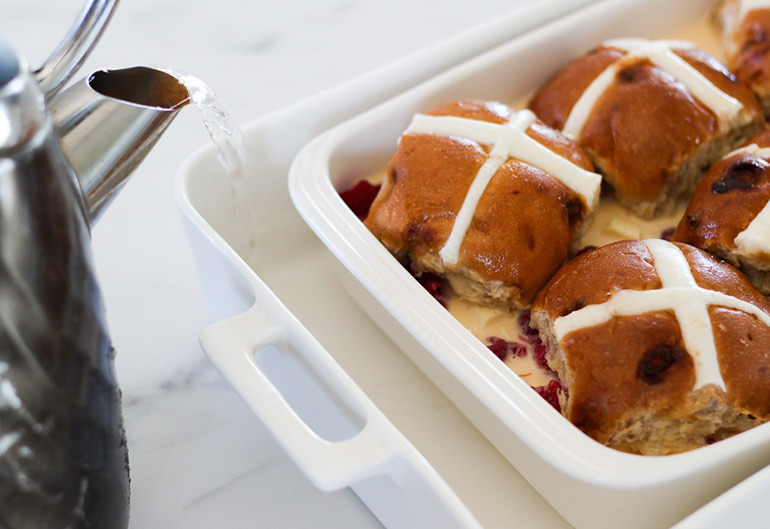 Place the hot cross bun tops on top of the bases, placing them off-centre. 7. Pour the remaining custard over the bun tops. Press down lightly on the buns to squish them into the custard a little. Set aside for 15 minutes for the buns to soak up the liquid. 8. Preheat the oven to 160°C. Carefully place the pudding dish in a roasting pan. Using the kettle, fill the roasting dish with boiling water until the water level is halfway up the side of the pudding dish. SAFETY NOTE: Save on splash burns by placing the dishes in the oven first and THEN adding the boiling water. 9. Bake for 30 to 40 minutes or until the custard is just set, you still want a little bit of wobble in there! Remove from the water bath and let stand for 5 minutes before serving. This pudding serves 6 generously. It can also be made ahead and reheated or even eaten cold! 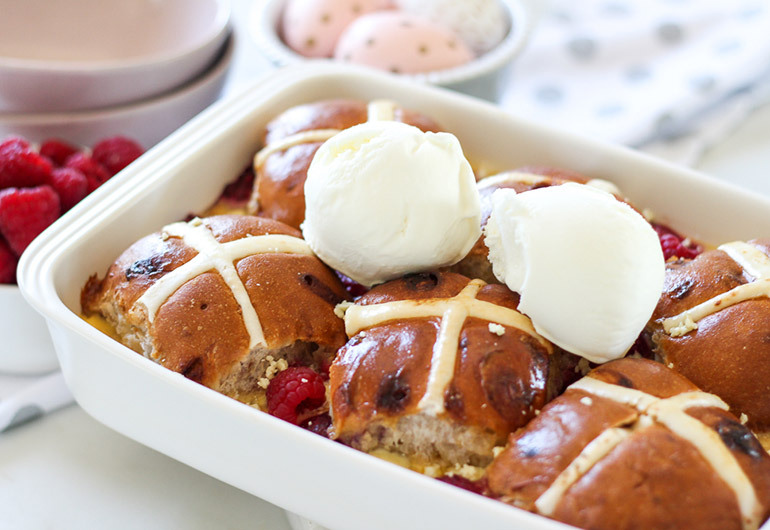 If you find yourself yearning for even more hot cross bun goodness, try the Woolworths Hot Cross Bun Ice Cream ($4.70 for 1 litre) for a real taste sensation. Creamy and full of cinnamon and raisins. Holy Easter Bunny, YUM! 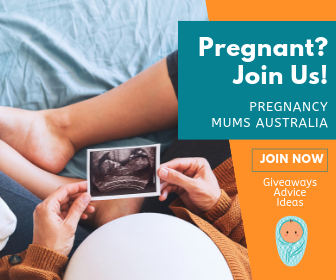 We here at Mum Central hope you have a wonderful Easter, get your fill of Easter treats and enjoy spending time with family and friends. Entertaining a crowd this Easter? Here’s a handy step by step guide how to create amazing grazing platters, perfect for feeding a crowd of any size! Woolworths are not only excellent for their everyday good prices, they’re also magnificent on their specialty items too. 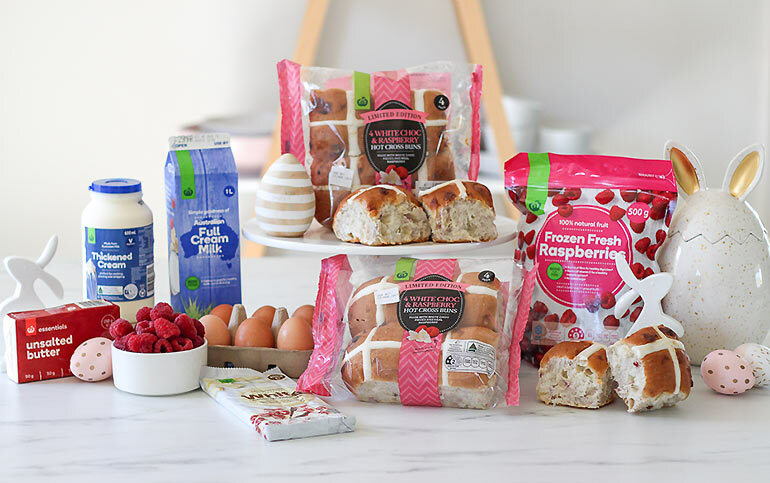 Give Woolworths branded products a go this Easter, delivering big on both taste AND savings. Beat the Easter rush and hop on into your local Woolworths store to start your Easter shopping today! This is a sponsored post for Woolworths.